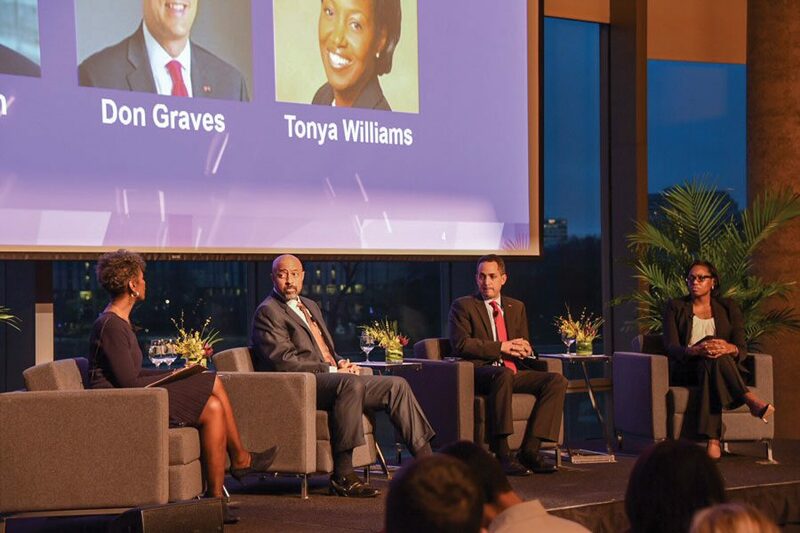 Former White House staffers Don Graves, Roy Austin, Tonya Williams speak at a Tuesday event moderated by NU alumna Dorothy Tucker. The group spoke about gun control and tax reform. Considering how President Donald Trump has reversed several Obama-era reforms and initiatives, Don Graves, director of domestic and economic policy for former Vice President Joe Biden, said it feels like a “repudiation of the legacy” which he and many other people “pour(ed) their hearts and souls” into. Graves said the results of the 2016 election were tough to deal with. Graves spoke on a panel alongside two other former officials from the Obama administration: Roy Austin, who served as deputy assistant to former President Barack Obama for urban affairs, justice and opportunity, and Tonya Williams, who served as Biden’s director for legislative affairs. At the event, hosted by the Kellogg School of Management at Kellogg Global Hub, the three former White House staffers discussed current politics. About 150 people attended the talk moderated by NU alumna Dorothy Tucker, who currently works at CBS Chicago. Graves attributed the recent tragedy at Marjory Stoneman Douglas High School in Parkland, Florida — in which a shooter killed 17 people — to the Trump administration’s repeal of an Obama executive order that required some to get background checks in order to purchase firearms. As a result of Trump’s decision, people with “medically diagnosed, severe mental illness” cannot be prevented from purchasing guns. Williams said the Congressional impasse on gun control is caused by the “selfishness” of those Congress members who fear they will lose support from power players involved in the gun industry if they voted for gun control measures. “It is powerful interest. It is the (National Rifle Association) and the belief that the money that is put into the races will cause him to lose,” Williams said. Additionally, Williams critiqued the revised tax bill signed into law in December 2017 — which slashed business tax rates from 35 percent to 21 percent — for failing to also outline sustainable ways to compensate for the reduction in tax revenue. Graves said he worried the current tax package sends benefits of the tax break largely to the wealthiest people and corporations. Instead, the government should implement a tax break that directly benefits middle class Americans. “(Trump) is destroying the fabrics of every governmental institution and he is putting people in positions of power they don’t deserve,” Austin said. “Whereas a lot of people have just chosen to be comfortable and disengaged from public policy and the things going on in the government, as a member of society who is affected by the things the government is doing, I appreciate the fact that people feel more responsibility to do something about it,” Deslouches said. Austin said Trump has brought “permanent” damage to American society by aggravating income inequality and further marginalizing minority groups. However, he said, Trump has also spurred women and young people to protest against the current political dynamics, as seen in the #MeToo Movement and the proposal of a National School Walkout. The walkout slated for March 14 and the March for Our Lives on March 24 aim to call on Congress to act on gun violence by enforcing tougher gun laws, following the impassioned speeches given by students who survived the shooting, according to an event page for the march.